Well Here Is Something Nice! Many thanks to all those who voted for me. I was nominated with some distinguished company, so your support and the resulting award means a lot to me. Full coverage of the event (and they did a great job with it!) is here. 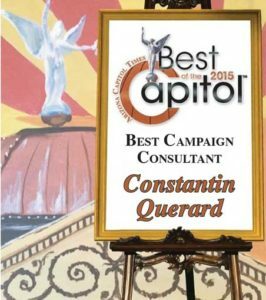 "If you look back at the last decade to determine who has had the most influence on the make up of the legislature, Constantin Querard would have to be at the top of the list." ...Yet the ire he raises might be matched by the respect and sympathy of supporters who view him as a highly motivated and intelligent campaign consultant for social conservatives; a sort of media-bullied rebel hero, thorn-in-the-side of the liberally biased creators and administrators of Arizona's system of publicly funded elections. The more neutral observers will note his effectiveness, saying the election of [Querard's] clients, including Mr. Smith, has helped to create the most conservative Legislature to be seen in years..."